Many people have heard of Hungary’s Tokaj wine region – famous for its sweet wines – but did you know there are a total of 22 wine regions in the country? For an easy day trip from Budapest, head to Etyek, just over 30 minutes west of the city. Etyek is one of Hungary’s youngest wine regions, with a viniculture that dates back to the 18th century. Originally, Etyek produced sparkling wines, and it wasn’t until the 1980s and 90s that wineries began making the switch to other varieties. 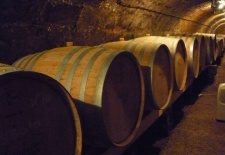 Today there are about 30-35 wineries in Etyek. Many are small operations whose vintages rarely leave the region, let alone wind up exported to the U.S. On my recent trip to Budapest, I visited the Rókusfalvy winery (www.rokusfalvypince.hu). The winery – with just 13.5 acres of vineyards – started as a hobby for its owner in 1999 but expanded production in 2006. The majority of grapes grown are whites, including Chardonnay, sauvignon blanc, and pinot gris. Due to its small size, you can only find Rókusfalvy vintages at a select few restaurants and wine shops in Budapest, at the winery, and at the nearby Rókusfalvy Fogadó inn and restaurant (www.rokusfalvyfogado.hu). I stopped there for lunch before a tour of the winery and cellars (pictured at right). Staff says the restaurant serves unique food you won’t find elsewhere in Hungary (think neck of veal with pearl barley; the soups are also a delicious option). It’s incredibly affordable for what you get – the most expensive main course is $16. If you decide to spend the day sampling Rókusfalvy’s vintages and don’t want to worry about a designated driver, the restaurant can arrange chauffeured service to Budapest for just $34. Or, spend the night at the six-room inn for a mere $89/night with breakfast.